Members of the Xenia Elks spent some time with patients at the VA hospital during Memorial Day weekend. 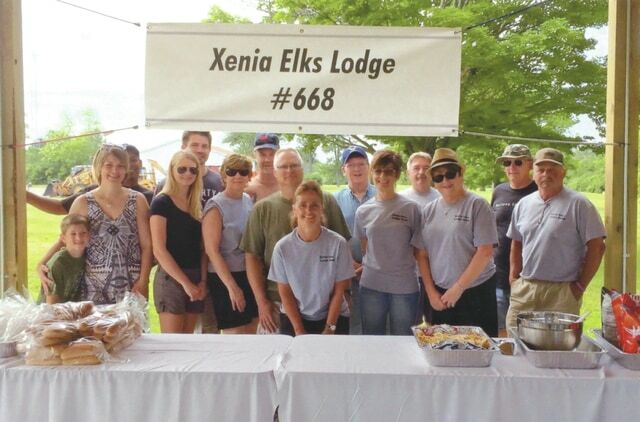 XENIA — Members of the Xenia Elks held a Memorial Day cookout with patients at the Dayton Veterans Administration Hospital. Approximately 80 veterans were treated to burgers, hot dogs, baked beans, corn, soda, water, cake and ice cream and also had a chance to play corn hole and listen to live music. Patients also received a Xenia Elks T-shirt, flip flops, socks and drawstring bags with the message “Thank you for your service” printed on them. The patients also received Canteen bucks so they can get personal items they need at the in-house store.